“TED Talks and YouTube are not new persuasion technologies. They are a new distribution system for a very old technology: visual oration. We now have an age-old winning persuasion technology combined with an unbeatable new distribution methodology.” – Roger Martin, Harvard Business Review. In his blog post at Harvard Business Review, Roger Martin Premier’s Chair in Productivity & Competitiveness and Academic Director of the Martin Prosperity Institute at the Rotman School of Management, muses about the power of video for influencing people. He summarises, nothing is more persuasive than watching a talented speaker present. The limitation of public speaking is the number of people who can be physically there to be influenced. This isn’t the case with online video, which can be viewed by millions of users at a time of their choosing. No wonder, advertisers, marketeers and publishers are generating more and more video content. No where is this more prevalent than among news publishers. 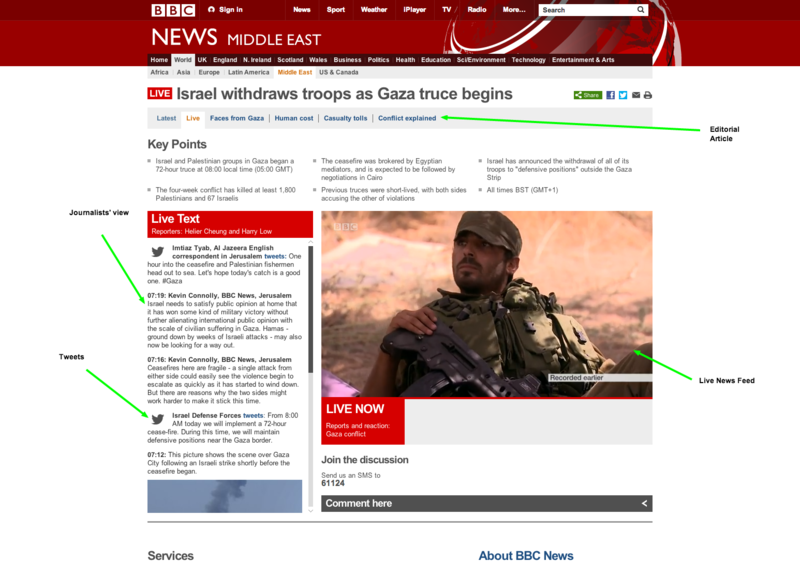 The screenshot of BBC news page (below) on the recent Gaza conflict demonstrates how the BBC is combining full editorial content with live video news, in the field comments from journalists, images and tweets to provide a comprehensive digital coverage online. The challenge for leading international publishers such as the BBC, Financial Times and Press Association is in selecting the most appropriate content from the vast volume of digital content generated by their journalists and third party news agencies. The Press Association for example, generates lots of multimedia content which is used by other news organisations such as the BBC. How does the Press Association find appropriate content for a particular news item from among it’s library of text, video and audio content? How does it provide this catalogue of it’s multimedia content to third party news organisations such as the BBC, so as to generate revenue from all it’s content? To address the issue of aggregating text content from various journalists based on a topic or subject, the BBC designed and built the Dynamic Semantic publishing platform. What is Dynamic Semantic Publishing? Dynamic Semantic Publishing is a term coined by the BBC to describe their publishing framework. They use natural language processing to semantically annotate their content using a domain specific ontology. Then by using linked data technology to automate the aggregation, publishing and re-purposing of interrelated content they provide a greatly improved user experience and high levels of user engagement. Journalists focus on creating great content. Challenge 1: The detailed metadata is required to select the correct content to display to the user based on topic or subject of the news. Challenge 2: Information architecture for the publishing platform needs to consider the many different ways the content for a particular news item is aggregated or how the user may want to access and navigate that news content. For an international news organisations such as the BCC, a static approach to content aggregation was not sufficient. Hence, they built a platform that can semantically annotate any BBC content. Other news organisations are following the BBC’s lead and building similar platforms. With various news publishers semantically tagging their content against a semantic knowledge graph (linked data), it will be better if there was a standard model that can be shared among news publishers. This will enable the publishers to share and use each other’s semantically enriched content. The W3C has created a new working group, the Web Annotation Working Group, with the very same goal of creating a structured approach of creating associations between pieces of information, that is web accessible. By creating a common approach to annotations, it will be possible for news publishers to develop an annotation ecosystem, where they will have access to each others annotations and thus be able to effectively re-use each other’s content. The Press Association for example generate multimedia content that is used by other news organisations such as the BBC in their reporting. A shared annotations model between them will make it easier for the Press Association to make their content catalogue available to the BBC editorial team. The Financial Times which now also produces video content for the digital edition of their paper is working with other news agencies such as Press Association to define a common annotation standard. In the video presentation below, Jem Rayfield of the Financial Times describe their effort to date. The work undertaken by W3C and news publishers focuses on annotating text content. It doesn’t deal with video or audio content. With more video and audio content being generated by news journalists, it is important to define a standard way to annotate fragments of video and audio content, so the suitable fragment can be aggregated and published with their interrelated text content. The goal in MICO is to build on the work being done within W3C Media Annotations Ontology to develop a standard annotations model for multimedia content to enable the effective querying of text, video and audio content on any subject. At Zaizi, we deploy Alfresco Enterprise Content Management system for global organisations with large volumes of content including publishing companies. Alfresco is the leading open source enterprise document and records management platform. Alfresco is being used by BBC and Press Association to create, manage and publish their multimedia content. With our ContentLinks add-on for Alfresco we already provide a semantic text enrichment tool. However, it is important for us to provide a semantic media analysis platform, that is able to not only annotate text but all multimedia content. This will enable our customers to access all their multimedia content in a standard way, and also make it available to their own customers and partners. Once, all the multimedia content is accessible via a standard model, we can provide cross media recommendations for content within their Alfresco repository. With MICO we will be able to provide our clients with a semantic media analysis platform with capabilities to analyse “media in context” by selecting suitable analysis components that can work in sequence within a pipeline on the content, with each adding their bit of enrichment information to the final result. Analysis components can be a “language detector” (identifying the language of text or an audio track), a “keyframe extractor” (identifying relevant images from a video), a “face detector” (identifying objects that could be faces), a “face recogniser” (assigning faces to a known person), an “entity linker” (assigning objects to concrete entities) or a “disambiguation component” (resolving possible alternatives be choosing the more likely given the context). Content once, semantically enriched and mapped to linked data enables knowledge graph based search. The demo below showcases the Semantic Text search. With MICO, we will be able to include both audio or video content as well. It also enables multi-lingual search. Alfresco, extendable platform makes the perfect enterprise digital platform for content publishers. Once, the multimedia content is semantically enriched users will be able to query the repository for all content on a topic or subject and not only find the best video or audio content, but will be shown the correct snippet within the video and audio content. Alfresco’s content transformation services, will then be able to render this snippet as a stand alone clip for the author to select and embed. It will also be able to recommend other media content based on the topic or subject. Zaizi are thrilled to be part of the MICO project and the possibilities it provides us in building intelligent content applications by integrating Alfresco and Drupal with a Semantic Media Analysis Platform.